A stroll through Dalt Vila, Ibiza’s old town. 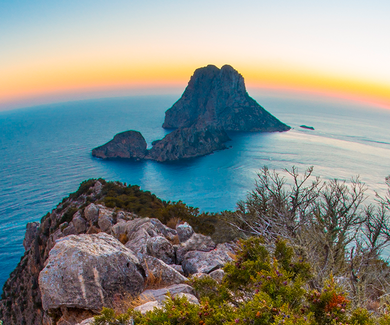 The island of Ibiza is known the world over for its idyllic beaches where the turquoise waters of the Mediterranean lap on its stunning shores as well as for being one of the world’s top electronic music destinations. Year after year, millions of tourists travel there from hundreds of countries around the world travel to take a dip in cala Bassa or cala Salada, to attend world-famous events like ANTS or BIG by David Guetta, and to dance their hearts out to the music of Dimitri Vegas & Like Mike, Martin Garrix and a host of other great DJs at the Ushuaïa Ibiza Beach Hotel. Anyone who visits Ibiza knows that every hour in the day there is gold. Savouring every single minute is a must! And spending a couple of hours visiting the cultural delights of Ibiza’s old town, Dalt Vila, is highly recommended. Its name means ‘high city’ in the local dialect and its history dates back over 2,500 years. If you fly into Ibiza by plane and you’re lucky enough to travel in daylight, look out the window and enjoy the spectacular views and mysterious aura of Dalt Vila. You’ll recognise it straight away: it’s a sort of walled city perched on top of a little hill, with a cathedral on the clifftop and the port at its feet. And its little houses gleam in all their whitewashed glory! The old town of Ibiza was declared a UNESCO World Heritage Site in 1999. Its stones, alcoves, and buildings captivate all who venture into its narrow, cobbled streets, stumbling across all sorts of treasures from the different civilisations that have inhabited this magical island. Always climbing upward, the views growing more stunning with every step, a walk up Dalt Vila calls for comfortable, sturdy footwear and a good camera so you don’t miss the awesome photo ops. All of its paths lead to the Cathedral of Santa María de las Nieves. Between the houses of Dalt Vila, you’ll find signage describing the history and meaning of the main historic highlights, such as the strongholds used to defend the city from pirate and barbaric attacks centuries ago. Also nestled in Dalt Vila is the headquarters of the Council of Ibiza, the Museum of Archaeology, where you can learn about the history of the island, the old town’s vantage point and several churches, such as the Church of Santo Domingo, with its neighbouring cloistered convent. Here, at the island’s oldest convent, the Augustine nuns prepare typical Ibizan sweets and their famous red pepper ‘coca’. How about a walk through the old town of Ibiza and a taste of the local traditional homemade delights made by the cloistered sisters? With a bit of luck, you might even hear a rendition of their heavenly chants. You’ll also find that the old town has an excellent selection of restaurants where you can enjoy a fabulous meal under the stars in the middle of the Mediterranean; not to mention a host of quirky little craft shops with local handmade products, Adlib fashion garments, and high-quality costume jewellery hand-crafted by local artisans. But the most incredible thing about an amble through Ibiza’s historic quarter is the stunning views of Formentera and the breath-taking sight of the gorgeous blue horizon -it will stop you in your tracks. Look out along the coastline on your right and you’ll see the striking towers of the Ushuaïa Ibiza Beach Hotel and the Hard Rock Hotel Ibiza, taking pride of place on Playa d’en Bossa. 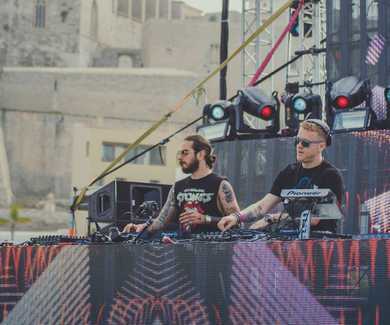 Dalt Vila is also home to numerous events every year, like Ibiza Medieval, held on the second weekend of May, with dozens of Medieval craft and gastronomy stalls set up along the hilly streets of Ibiza’s old town; and the IMS Ibiza International Music Summit Dalt Vila, also held in Dalt Vila before the summer kicks off and which attracts quality electronic music experts from all over the world to talk about the past, present and future of the genre. The walls of Dalt Vila date back to the 16th Century. It was King Phillip II who, concerned with safeguarding the island against possible Pirate and Ottoman attacks from the sea, ordered the magnificent walls to be built. Why did the island need protecting, you ask? Well, the wealth and the value of its resources was well known back then too! Now, close your eyes and start picturing a stroll through the old town of Ibiza. Feel the fresh air, enjoy the smell of the sea…let the adventure envelop you! 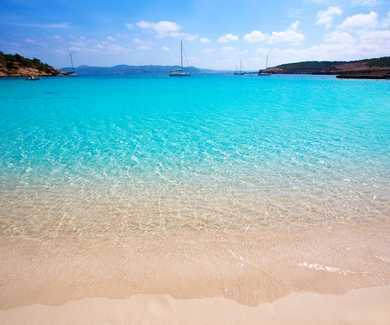 Cala Bassa, one of the most spectacular coves on Ibiza! 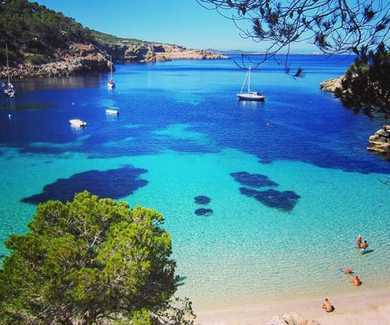 Cala Salada is one of the best coves in Ibiza, featuring clear turquoise waters. 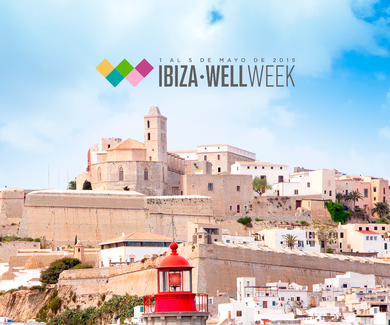 Ushuaïa Ibiza Beach Hotel launches Ibiza Well Week on the 1st of May.